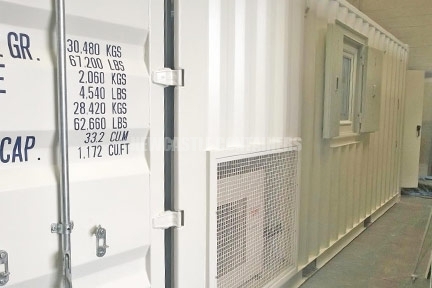 Both units were lined with 85mm of non-combustible spray foam insulation applied to the container walls, ceiling and cargo doors. The spray foam was then overlaid using 12mm multipro which gave the unit a clean white finish. 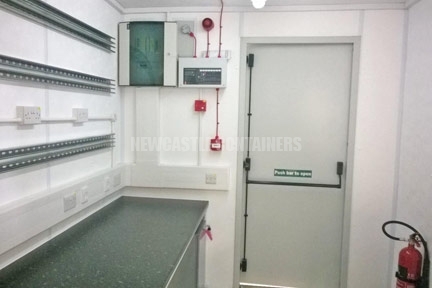 Both units had 3mm steel chequer plate flooring installed over the original marine ply wood. Both units had full fire alarm systems installed, complete with fire extinguishers. Both units had recessed fire exit personnel doors, for a quick easy exit. 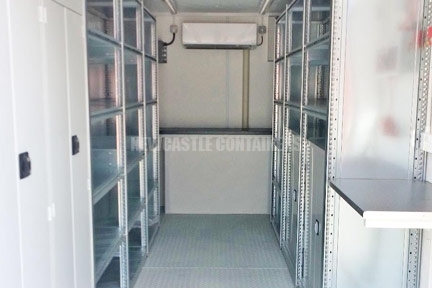 A large 30,000BTU air conditioning unit was installed in the control unit, this was required due to the amount of heat that would be produced by the computer and monitoring equipment A smaller 15,000BTU was installed in the store. 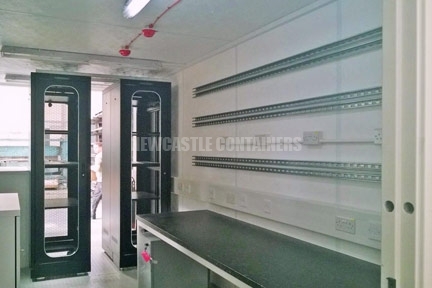 Both containers were fitted with metal clad 13amp twin sockets, double network switches with excess cable for customer to install network switches, variations of 5ft double strip lights and 4ft single strip lights with switches, emergency Lights with relevant protection and 3ph 5pin external sockets within recessed boxes approx. 300mm x 200mm. All electrics were NICEIC certified. 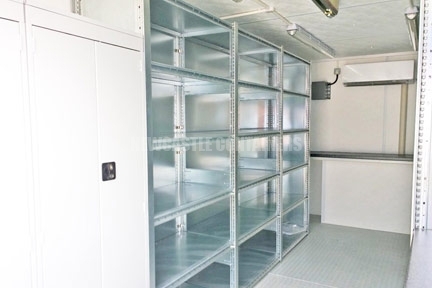 The store was fitted with large lockable cabinets, two timber desks, heavy duty steel shelving with additional lips for shipping and a ceiling beam which held a safe working load of 1000KG. 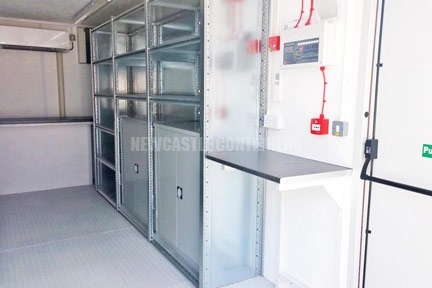 The control unit had the additions of a secure UPVC double glazed window with tilt and turn mechanism, wall mounting struts for the customer to fit their nineteen monitors, Roxtec cable glands, 19” full height racks for electrical control equipment and draws within lockable steel pedestals. Both units were repainted white RAL9001 and the original shipping decals were removed post paintwork to reveal the numbers. Upon completion, they were sent for testing and provided with a LOLER1998 test certificate to circa 10tonnes SWL.